After having all kinds of trouble solving Washington’s aggressive zone defense in Salt Lake City last month, Utah’s basketball players and coaches thought they had answers for Wednesday night’s rematch in Seattle. “I’m confident that we can get some things done,” coach Larry Krystkowiak said on the Utes Sports Network pregame show. The strategy of having Sedrick Barefield make a bunch of long 3-pointers worked for a while, but was not sustainable. Pac-12 leader Washington surged ahead late in the first half and rolled to a 62-45 victory at Alaska Airlines Arena. Utah’s first basket of the second half didn’t come until the 8:50 mark, ending a stretch of nearly 16 minutes without a field goal. After scoring 17 points in the game’s first seven minutes, the Utes produced 12 points in the next 24 minutes. They totaled 18 points in the second half (having started the half by going 1 of 14 from the field) and scored 28 points in the final 33 minutes of the game. And even that meager production required a late surge. Barefield led the Utes with 12 points, but was scoreless after making four 3-pointers in the first seven minutes. Utah shot 28 percent for the game. Washington had five double-figures scorers. The Utes (14-12, 8-6 Pac-12) fell to fourth place in the conference, although it helped them that Stanford and Colorado both lost on the road Wednesday and fell to a tie for sixth, one game behind Utah and a half-game behind USC. Washington (21-5, 12-1) moved closer to clinching the regular-season title. Ute freshman forward Timmy Allen missed his first game of the season, due to a back injury. Krystkowiak had credited Allen as being “a warrior” after playing in last Saturday’s loss to Arizona State. Allen plays an important role in the middle of Utah’s offense against zone defenses. Donnie Tillman made his first start since Dec. 15 at Kentucky, replacing Allen, but was ineffetive. The Utes had shot 33 percent from the field in a 69-53 loss to Washington at the Huntsman Center — and this performance was much worse. Krystkowiak hoped that being somewhat accustomed to the Huskies’ defense and “having a little bit of poise,” the Utes would have better results this time. That didn’t happen, after Barefield’s shooting gave Utah some encouragement early in the game. 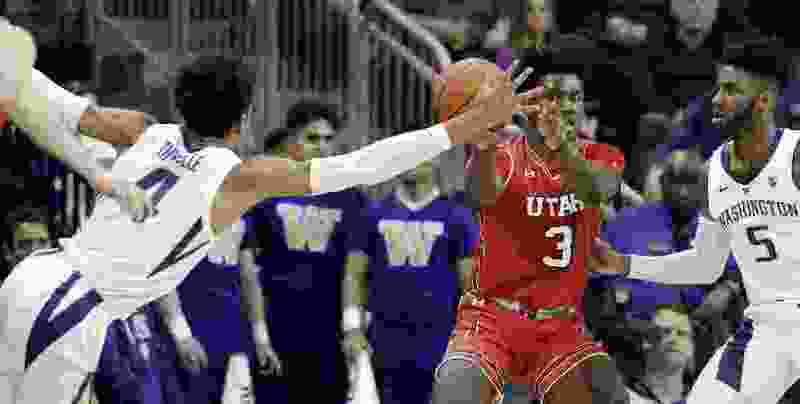 Barefield made four 3-pointers as the Utes took a 17-7 lead, but he went to the bench with two fouls not long afterward and the Utes struggled to hold onto the ball and take shots — much less make them — against the Huskies’ zone. Washington blocked four shots in the first half and the Utes committed nine turnovers, while shooting 30 percent from the field overall. Utah stayed in the game by playing good defense itself and making six 3-pointers, with Parker Van Dyke and Riley Battin hitting one each. The Utes stayed in front for most of the half, but Dominic Green’s late 3-pointer capped the Huskies’ 26-10 closing run of the half for a 33-27 lead. The Utes’ offensive difficulty continued as the second half began. Utah missed its first seven shots from the field and committed seven turnovers before Both Gach made a 3-pointer. Before that, Van Dyke’s two free throws produced some points at the 15:12 mark, but then the Utes fell into a drought of more than six minutes. The consolation for the Utes is their remaining four regular-season opponents don’t play Washington’s level of defense. That’s not to say there will be anything easy, though, about road games vs. Washington State and Colorado and home games vs. USC and UCLA. The Utes are only remain in the Pac-12’s top four, but they’re only 1½ games ahead of ninth-place UCLA.